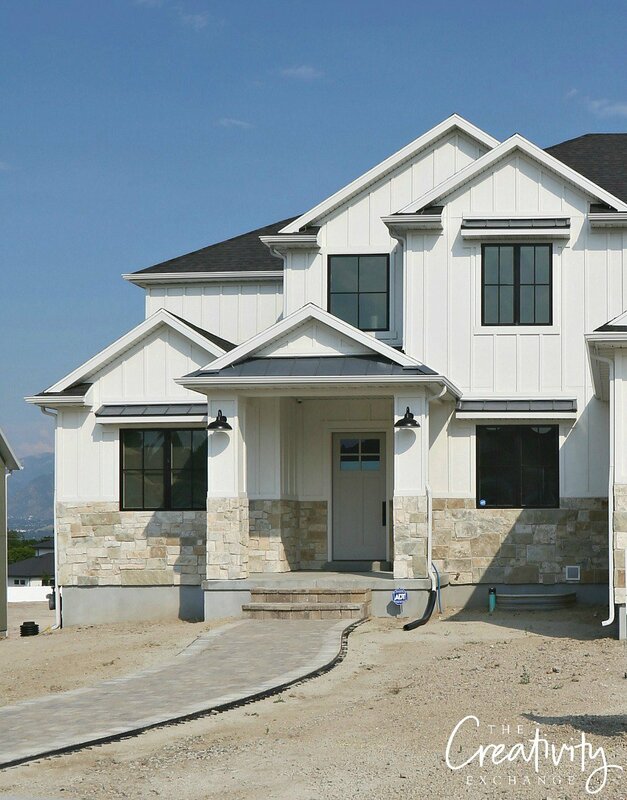 Are you struggling with choosing the right exterior paint color for your home? 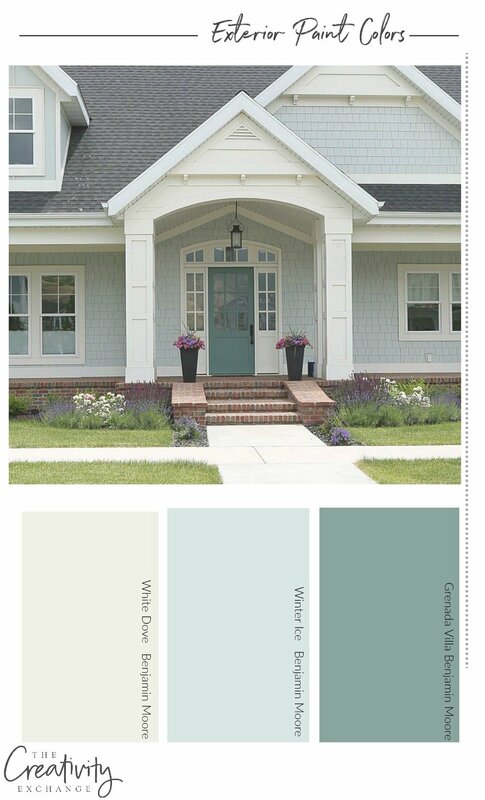 I’m here to help and walk you through each step for choosing the right paint color combination for the exterior of your home. I’m going to make this real easy for you guys, I promise! 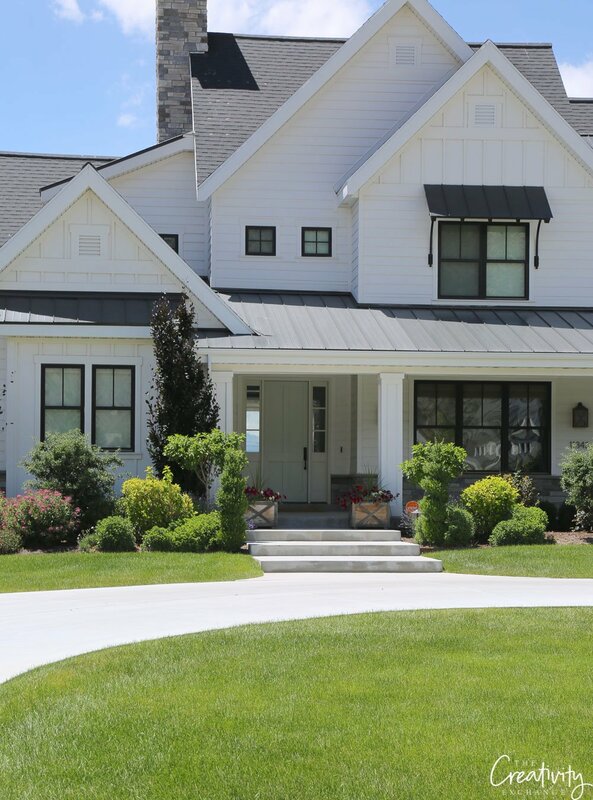 The number one paint question I have received over the years is about choosing exterior paint colors because it’s one of the most difficult paint decisions you can make for your home. You want your home to have beautiful curb appeal and you don’t want to make any color mistakes. 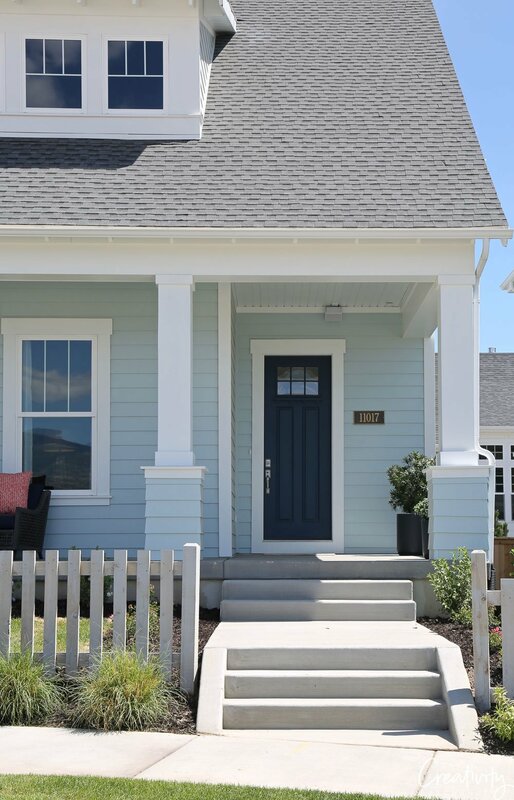 If you follow my seven steps below, I promise you will avoid the common mistakes and will be able to make exterior paint color decisions that will be beautiful! Stick with me on this! The first thing you will want to do when deciding what color you want to paint the exterior of your home is to choose the shade of a color first. When I say “shade”, I mean do you want a light, mid-tone or dark color on the body of your home? At this point, you don’t have to consider anything else except to make a decision if you want a light or white color, a mid-tone or medium shade, or do you want a dark color. For most of you, choosing a shade is an instant easy decision and you immediately know that you want a light or dark colored home. However, some of you may not be sure and are open to any shade and need a little help making that decision. It will help if you search Pinterest for exterior homes for inspiration to determine what shade would look best for your home. 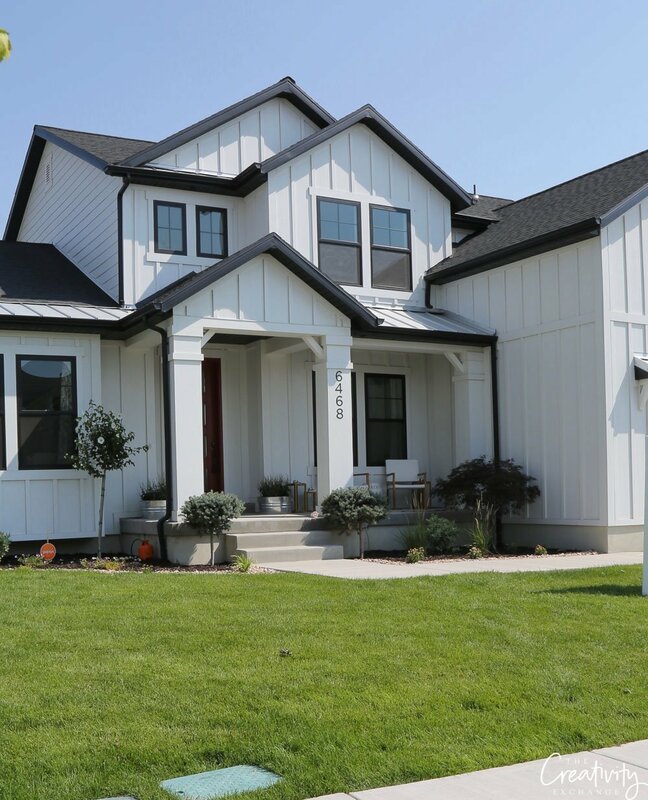 For example, if you have a ranch style home, search “ranch style home exteriors” in Pinterest search to see all the different color options to inspire you. Before you can go much further in your color decision-making, you will need to consider the color of your roof. If you have a black or neutral gray, you don’t have to worry as much about color clashing. Unfortunately, I have a dark brown roof with slight red undertones, so colors like shades of green or blues wouldn’t work for me and would clash. For those of you that have a roof with red, tan, green or blue gray undertones in your shingles, you will for sure need to factor in your roof color as you choose your exterior paint color palette. If you’re like me and you have a dark brown roof with shingles that have a red undertone, you will want to stick with a true neutral main body color for your home to play it safe. If you have shingles with green or blue gray undertones, you have a little more leeway and you will prevent color clashing if you choose a color that’s either neutral or has a slight hint of your shingle color in it to blend and compliment and not fight. If you have a black roof, you can pretty much do anything. If you have stone or brick on your home, you will need to also factor in any strong undertones found in your brick or stone. If your home is full brick and you just need to choose a trim color and I will match either the lightest, mid-tone or darkest color found in the stone/brick and use that as a trim color. 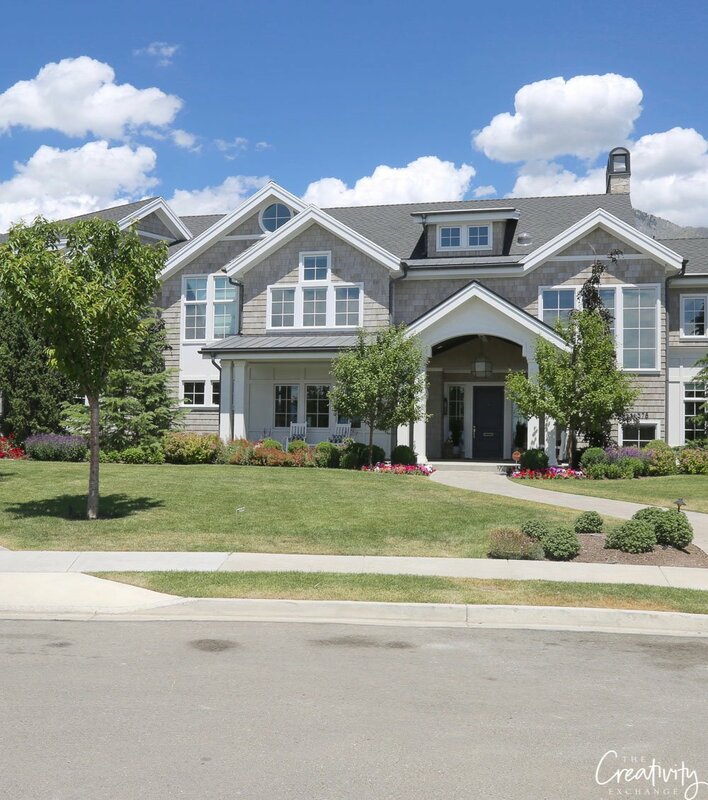 If your home is not full brick/stone and is either half stone/brick or you simply have brick/stone accents, you have a lot more wiggle room with color choices for the exterior body color of your home. As long as your body color has a very slight hint of the brick/stone undertone color, you shouldn’t have any clashing issues. For example, if your brick has a warm undertone and you want to go gray on your home body color, choose a light warm gray instead of a cool gray. That way, the warmth in the gray is what will tie/blend the new body color to the brick. Make sense? Next, after you have considered your roof color and decided on the shade, you will need to factor in the impact light has on exterior paint colors, which is unlike choosing colors for interiors. I’m going to save you a lot of time by telling you that daylight/sunlight will drastically turn your exterior color cool/blue, which is what happens to a paint color when there is an abundance of light. As crazy as this may sound, you will need to go at least 2-3 times warmer on your exterior color to get to a balanced color that won’t lean cool or blue. Let me show you what I mean. 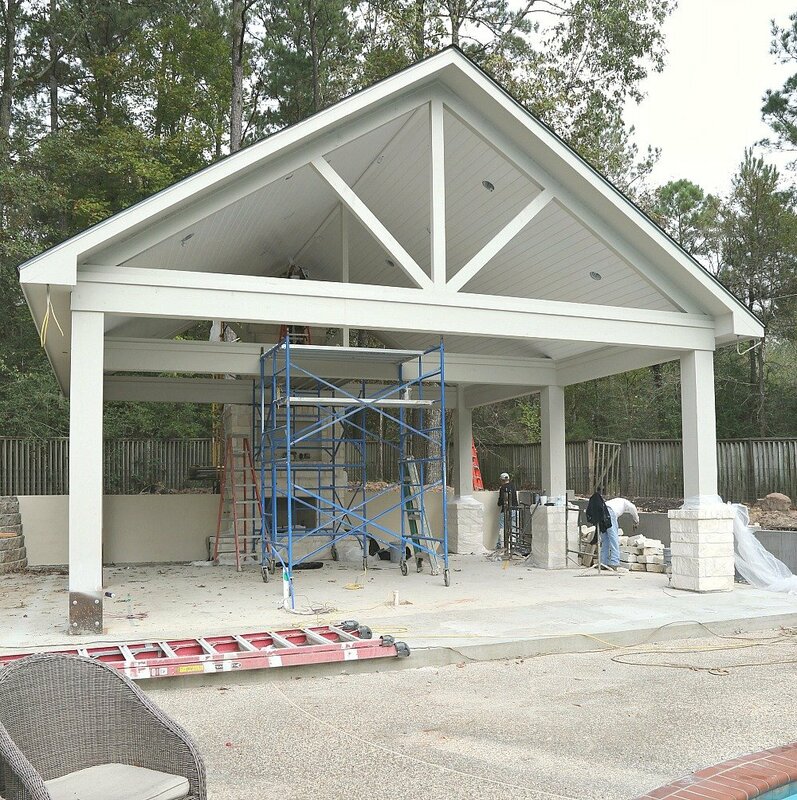 When it came time to paint the exterior of our pool house outdoor kitchen, I had to choose a color that was actually about 3 times warmer than what I wanted in my desired end color. I wanted an end color that looked like Sherwin Williams “On the Rocks” but because of the abundance of light that impacts exterior paint colors, I had to choose a color that was 3 times warmer to offset the color from going blue or cool. 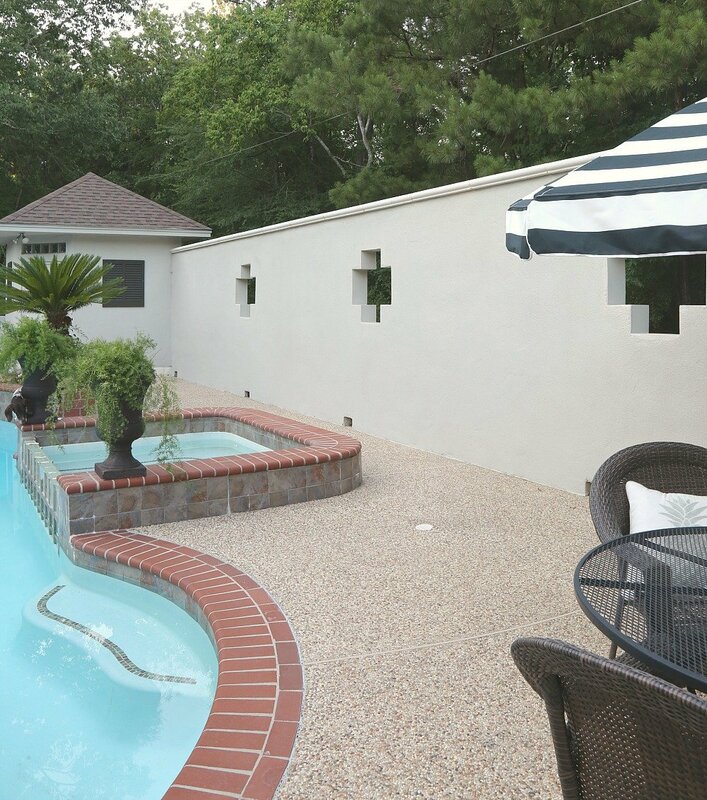 Yes, my pool house was painted in Burmese Beige but because of the light, it looks like SW On the Rocks. Isn’t that crazy what light does to exterior colors? So as you select colors, sample colors that are at least 1-2 warmer than the color you would ultimately like to have. My end color ended up being 3 times warmer. Keep in mind, if you want a white exterior, you will also need to choose a warmer white otherwise your home will have a blue cast. As you narrow your shade down, factor in roof color and know that you’ll need to go warmer because of the abundance of exterior light, next you will need to decide on an actual color for the exterior body of your home. It helps to look for similar home styles to get a feel for the possibilities. 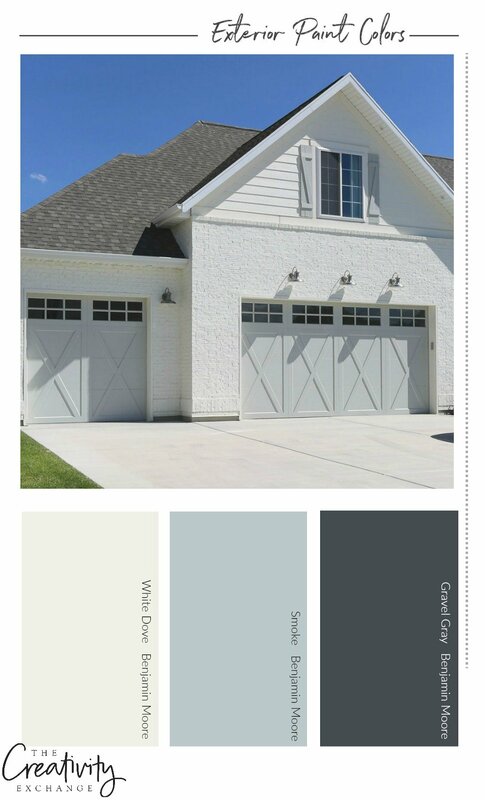 I have a Pinterest board here that is all exterior paint colors on homes that can really help you to visualize a color. 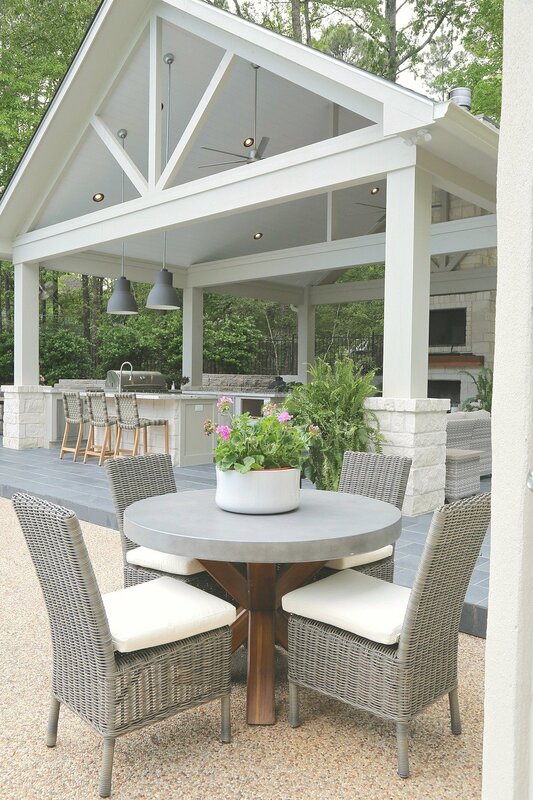 Now that you have picked a color, there are so many variables when it comes to the impact of colors on exteriors including which direction your home is facing and how much shading your home has that it’s impossible to safely choose a body color without sampling and looking at your samples at morning, mid-day and at dusk. This is such a critical step, especially when choosing exterior paint colors because the sun can pull out strange undertones that you may not see on the paint card. 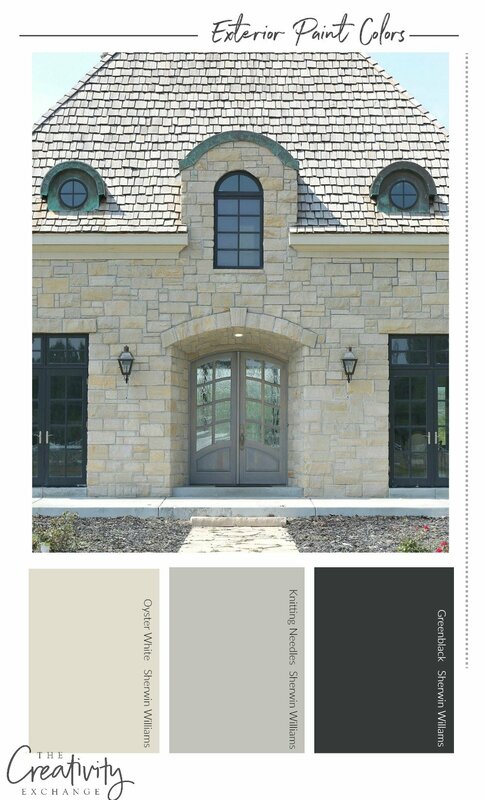 I tested multiple paint colors on my stucco wall to get to the right color for my pool house and stucco wall. I was so surprised at how warm I had to go. It’s critical at this point that you do the same and sample colors either on a poster board or directly on your home to get to play it safe and get the exact color that you will love for years to come. 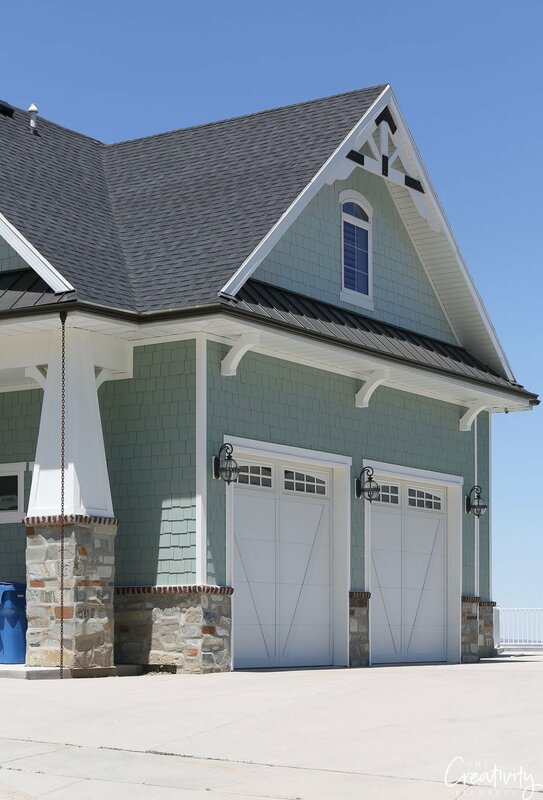 Once you have made a firm decision on the main exterior body paint color, you’re ready to move on and choose your exterior trim and accent colors. First, let me tell you when it comes to choosing trim and accent colors, less is more! I can’t tell you how often I work with clients who have a lot of architecture detail on the exterior of their home (shake, shutters, lots of changes in roof angles) who want to paint every detail a different color/shade because they think it will accentuate the architectural details. However, too much contrast and change of color/shades actually has the opposite effect and the eye stops at each color and the architectural details no longer stand out. 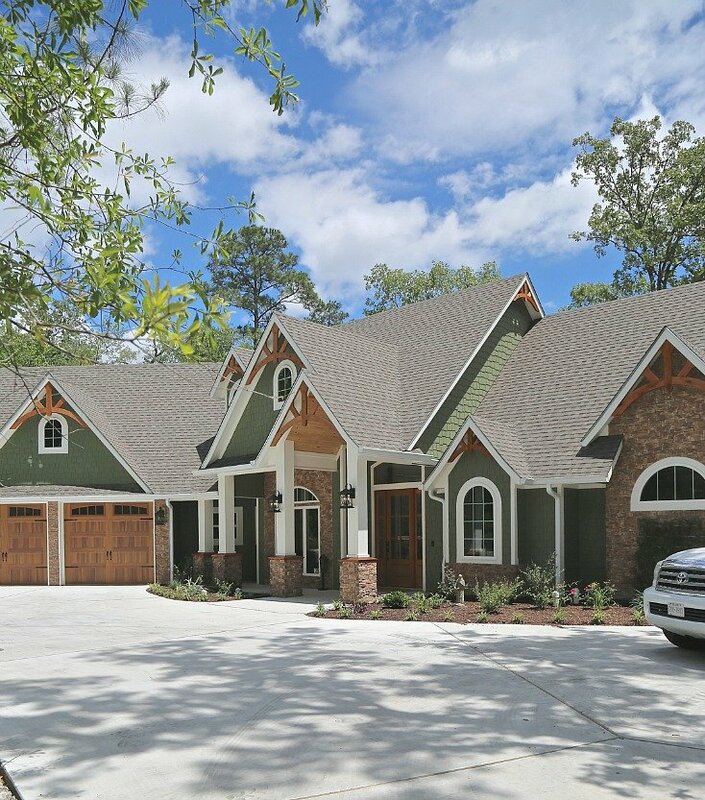 Last year, I worked with a couple who built a beautiful new home in a very wooded lot. They wanted their home green to blend in with all the trees. 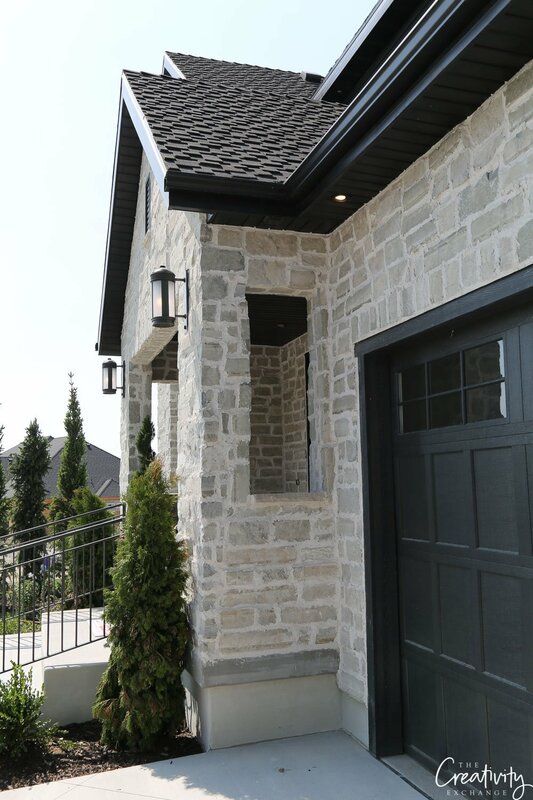 The home had a lot of different exterior accents/elements including shake mixed with traditional siding, several dramatic changes in roof angles, lots of wood trim, stone accent, etc.. Initially, they wanted to paint all those exterior accents a different shade/color and I encouraged them to stick with one main body color and one trim color because all those beautiful architectural elements would then stand out more and not get lost due to all the changes in color. Also, what people don’t realize is that stained wood trim and stone are colors as well. Below is how the home looked when we finished. Imagine how busy the exterior of the home would be if we used a lighter shade of green for the upper shake, darker green for the bottom traditional siding and a completely different color for the wood (chicken foot) at the top of the roof line. When I choose exterior trim and accent colors for my clients, 95% of the time I will work off of one paint color strip. 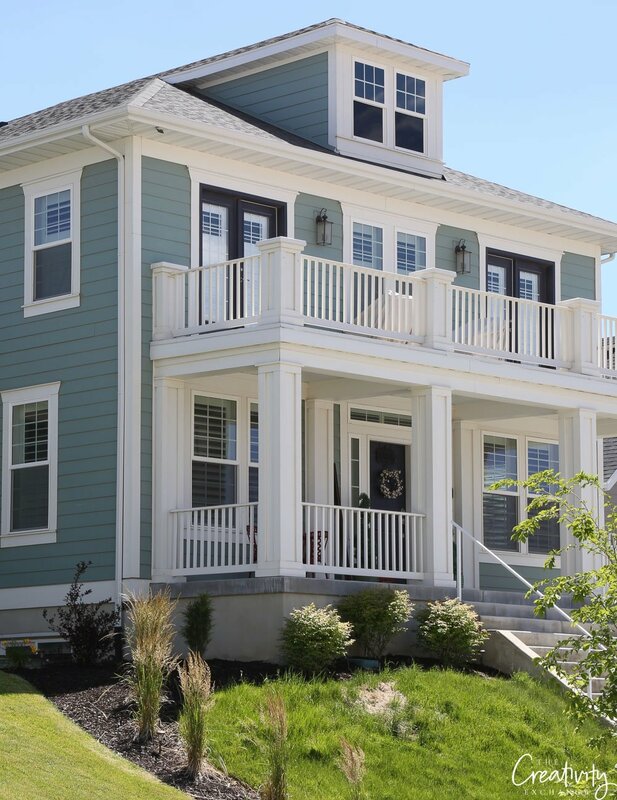 Because the sunlight will pull out undertones that is impossible to see on a paint card, this is the safest way to guarantee that the undertones in the trim and accent colors play well and work together harmoniously. 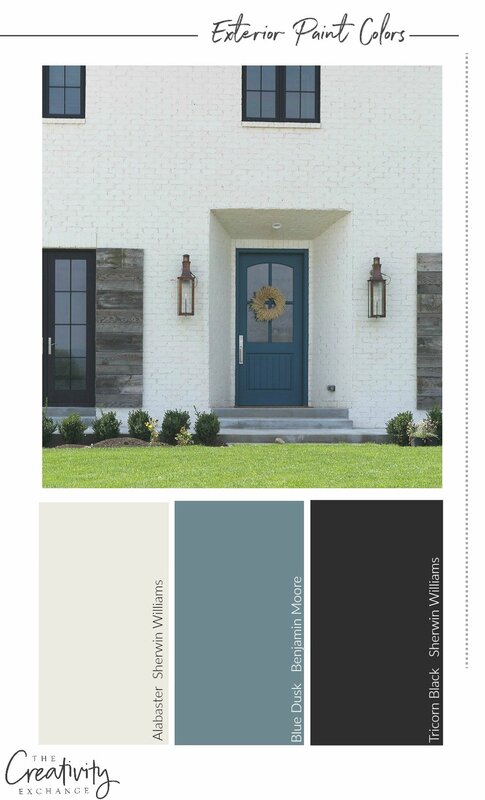 I will veer off the color strip if a client wants a completely different door color but for everything else, I stick with one color strip when it comes to exterior colors. 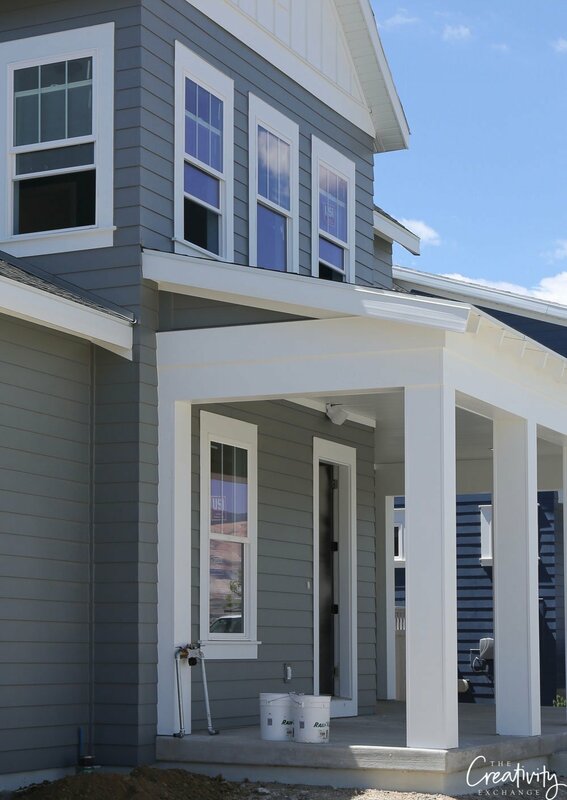 You have everything you need color-wise on one strip; main body color, windows and trim and contrasting door color. 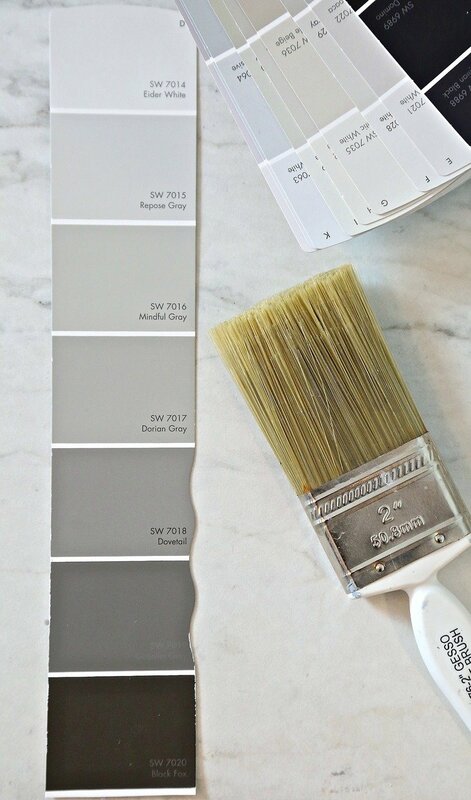 If a client wants to paint their home a light color like white, I will recommend painting trim/shutters/door with a contrasting darker color. If a client wants the body of the home darker, I will contrast with white everywhere else to balance and make sure the home doesn’t look too dark. If a client wants a mid-toned body color, I will base my recommendation for trim color based on the design of the home. If a home is modern, I will usually recommend a darker trim and if the home is more traditional, I will recommend contrasting a mid-toned body color with white. Below is a darker blue home with white trim and accents. The white keeps the dark blue on the body of the home from being too dark. Here is a white house with a black roof that the awnings and window are black to contrast. 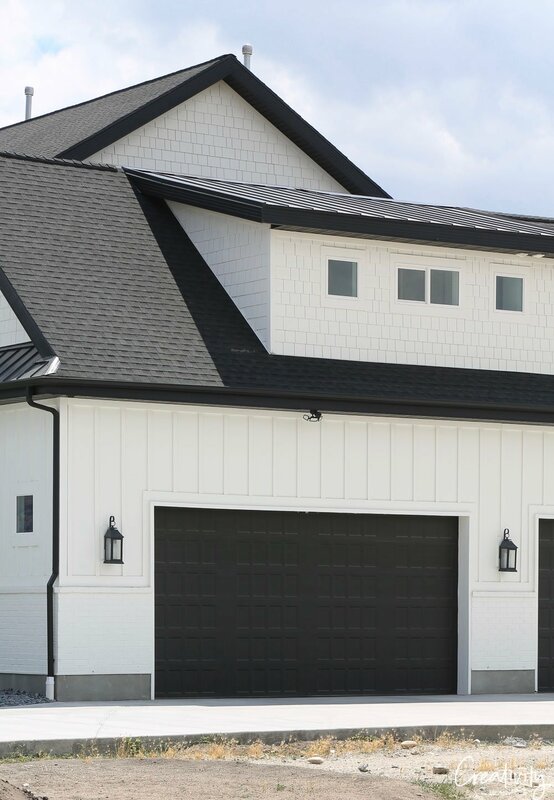 Below is another white home with a black roof and the trim and garage are black to contrast. 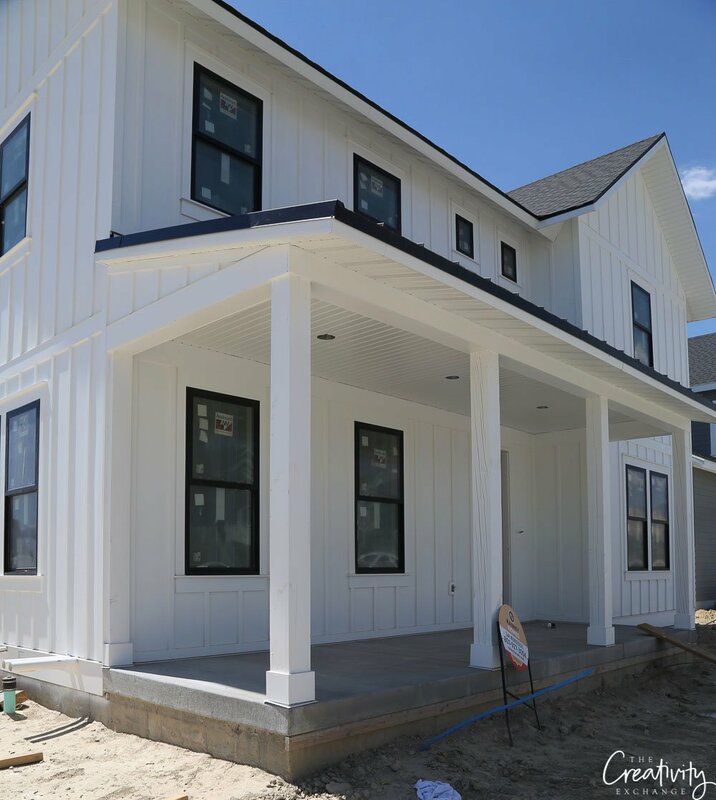 Below is a home painted with a mid-tone gorgeous blue and because the home is a coastal architectural style, the trim and exterior accents were painted white to keep the whole home looking light. 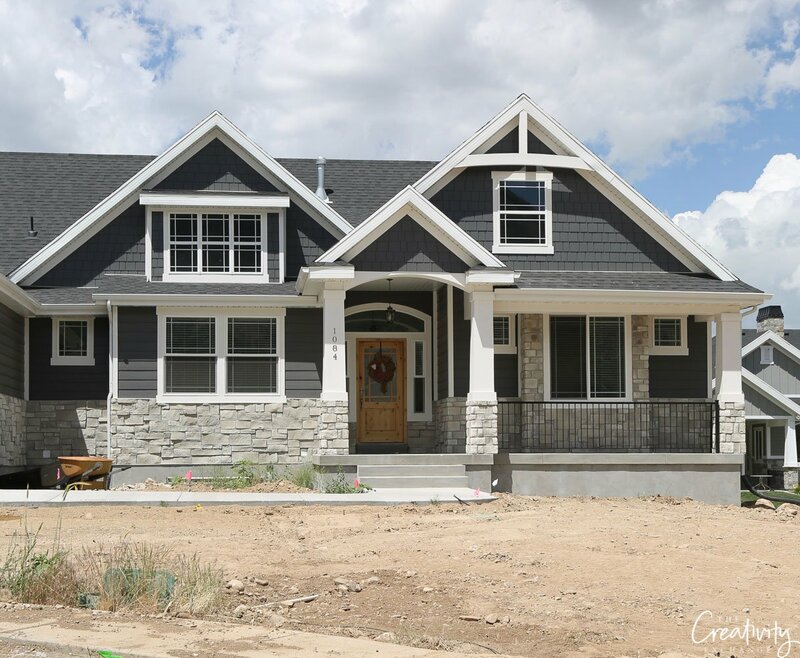 Here is a dark charcoal gray painted home with a lot of stone accent and the trim was painted white to balance and lighten the darker body color. Below is a mid-tone green painted home with a black roof and stone accents. 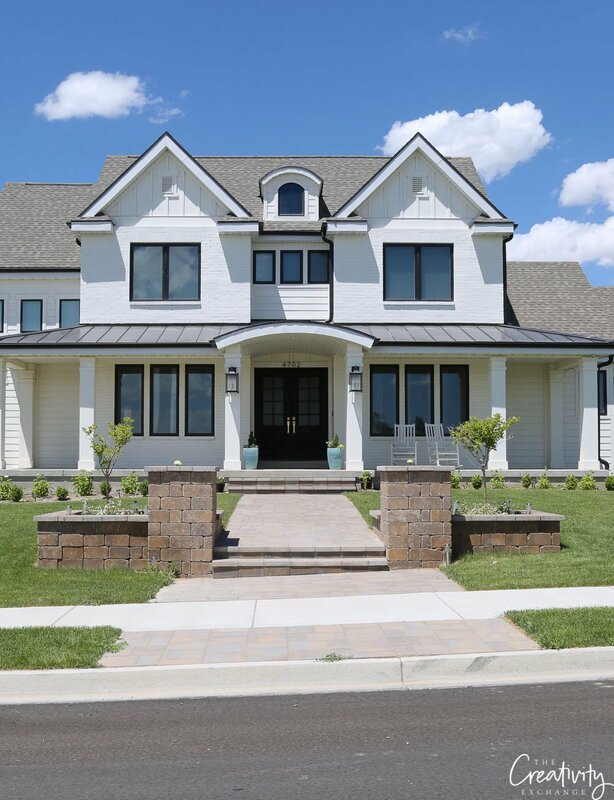 There are a lot of architectural elements on the exterior of this home but notice how the trim and all the accents were limited to one color (white) for cohesiveness and to balance the darker body color. 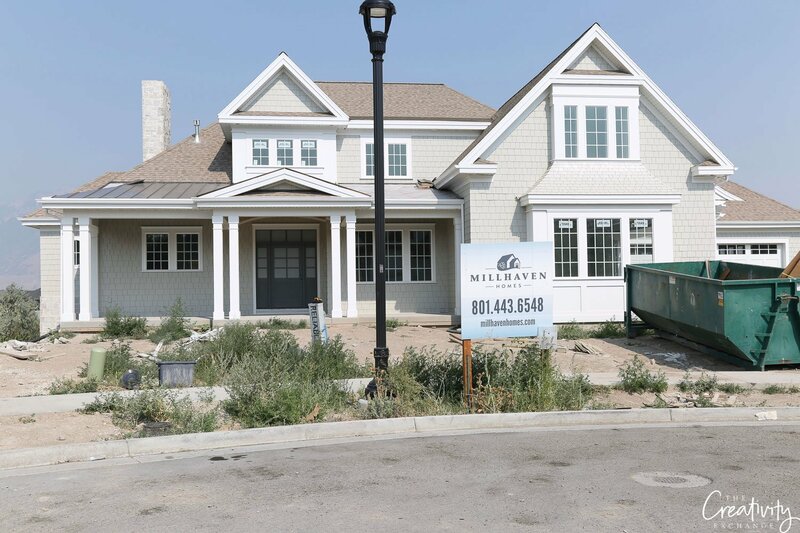 Below is a mid-tone (to light) painted home with dark brown trim and accents. Because this home is modern in design, it works. 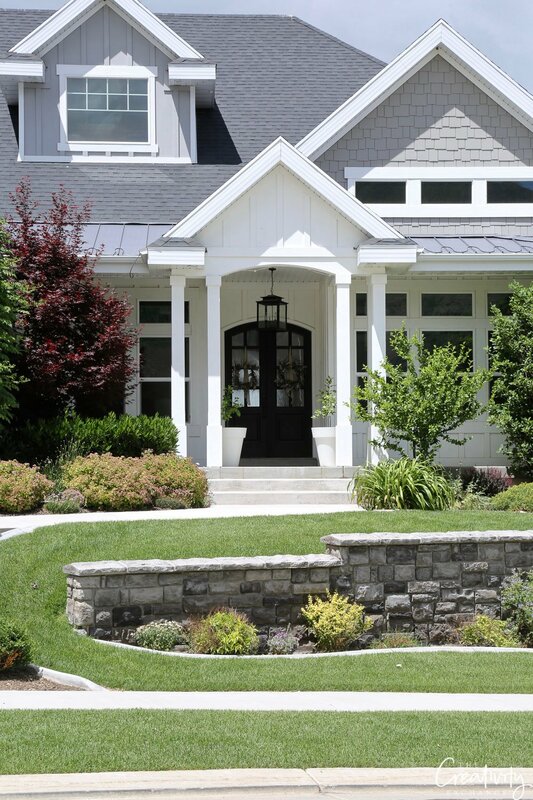 If this home was a traditional style home, I would recommend all of the trim and accents to be painted white. As you pull all of this together and I know it’s a lot to think about but I want to really help you again by mentioning that less is more when it comes to exterior colors. Anything more than 2-3 colors is too much on the exterior and as you look back at all of the examples above that I shared above, notice that most of the examples only have 2-3 colors used. Don’t forget that you will need to factor in that grids in your window/trim have a color as well. 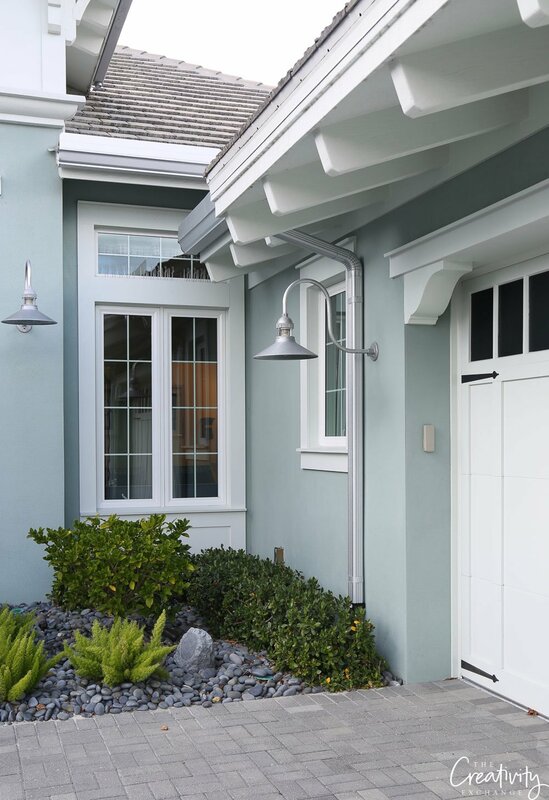 The architectural detail of your home will stand out more with less colors on the exterior, so don’t feel that everything is “suppose” to be a different color. I have been choosing exterior colors for clients for more than 10 years and I still only work with one color strip when it comes to choosing exterior colors to keep it safe and ensure that all the colors will blend beautifully. 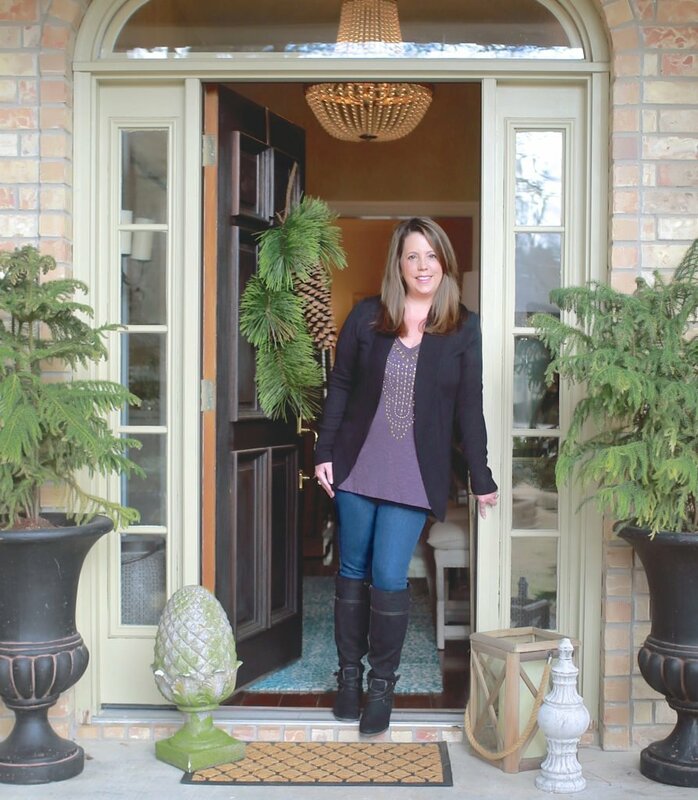 If you need help choosing the right exterior paint, you can find my tips here. If you have more questions, please leave your questions in the comments so we all can see. I will answer them as quickly as I can. I live in Phoenix, where flat roofed homes are very common and I’m the proud owner of one:. 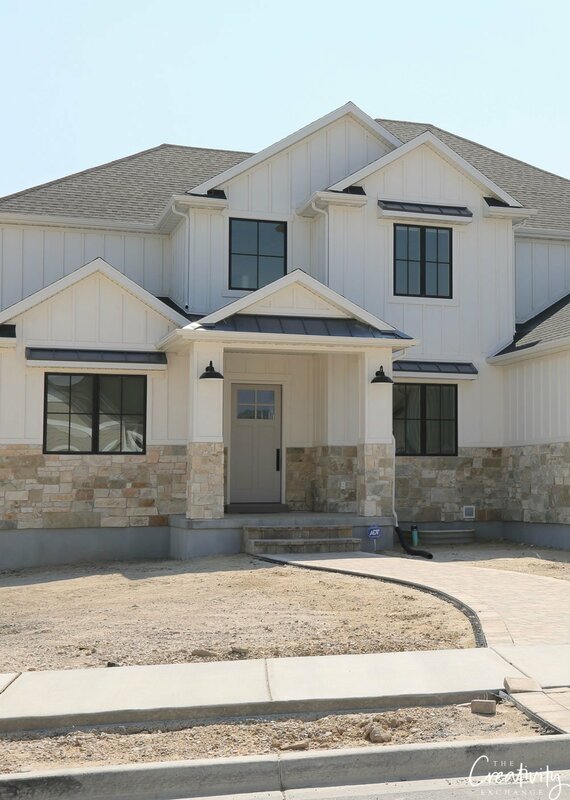 I’m trying to decide on a paint for my house, we want to paint it a shade of white, but there is not really a whole lot of roof to contrast with it, being that it is a flat roofed home. My concern is that the hone will look like a big shot blob ( if you wil) because there is not a ton of derails to be extenuated with another color. Do you have any recommendations? We just purchased an older one story home with a stucco exterior. The house (with attached garage) is all white (including the garage door) with black shutters. We want to paint the exterior and give it some personality and charm. The gutters are white. We’d consider almost any color except gray (as most of the interior is gray). We just had a new front door installed and that is wood toned. very well written, great visuals. we will be building a smaller home in the future and this contained a lot of helpful information. Really enjoyed this article . Thank you for including so many pictures after the explanations. On Step #7, “Less Is More”, the third picture down shows a white and grey house. Would you know those paint colors? Great post- thanks! 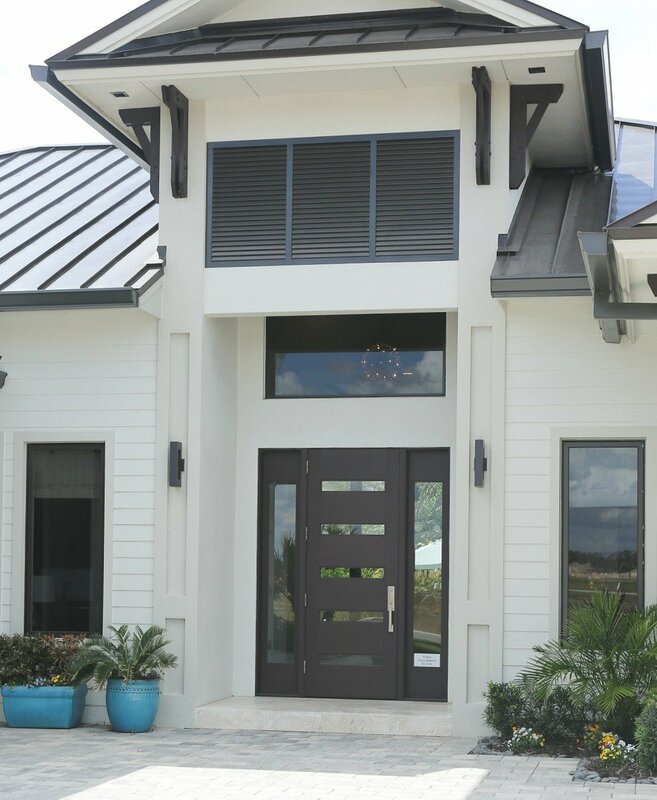 We are in the process of choosing an exterior color for a beach house. 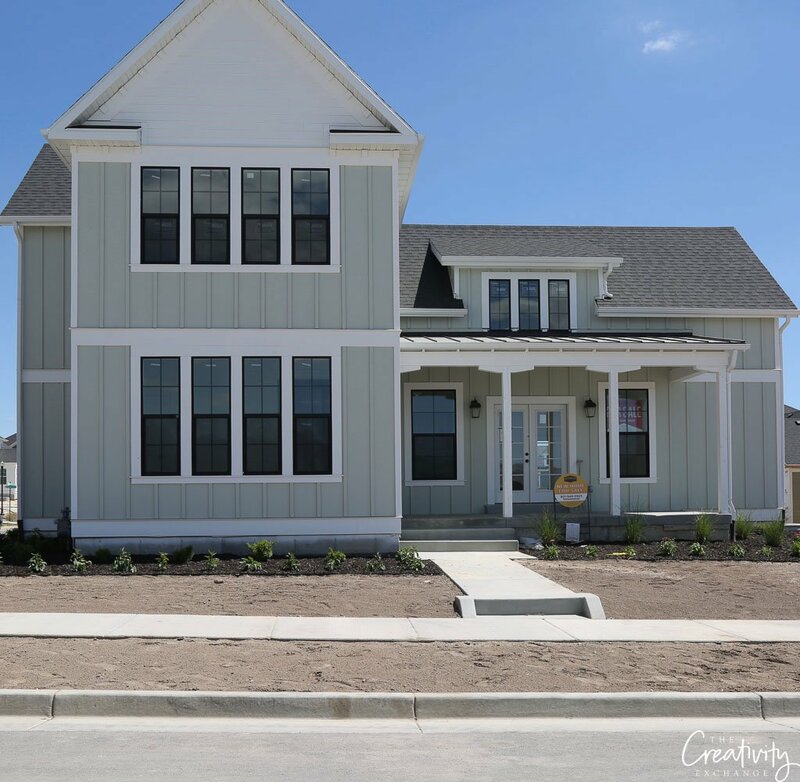 Looking for a gray similar to the house in the next to last photo. 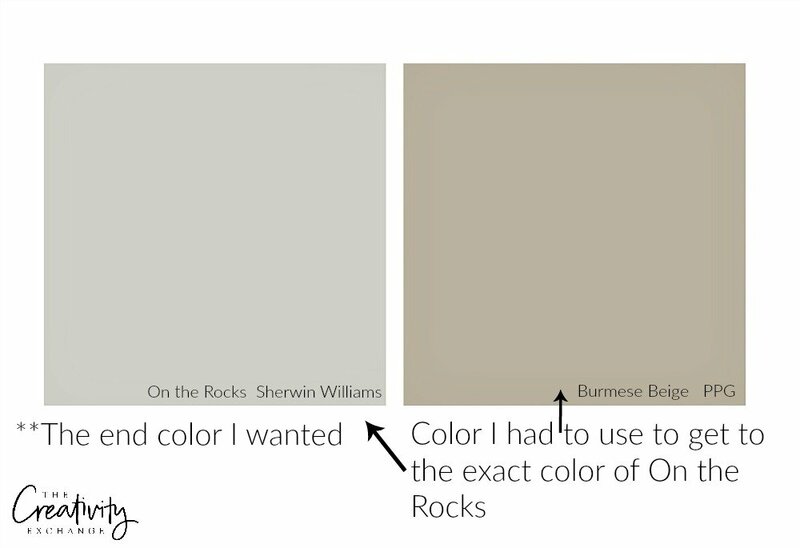 We have looked at Sherwin Williams Repose Gray and Light French Gray- How do you determine what color would be 2-3 times warmer? Thank you! What is the color on the Coastal home? I found this to be very informative. 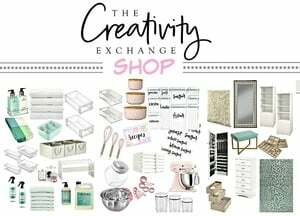 What did you use on the coastal home?